Work-to-rule protests by customs officials that have led to travel chaos at airports and Eurostar services in France have continued on Tuesday, while union representatives meet Ministers in an attempt to end the impasse. The protests began on March 4, and have affected passengers travelling through the ports of Calais and Dunkirk as well as the Eurostar terminal at Paris's Gare du Nord. Skiers hitting the Alps via airports in Lyon, Grenoble and Chambery have also been affected by the work to rule protest. 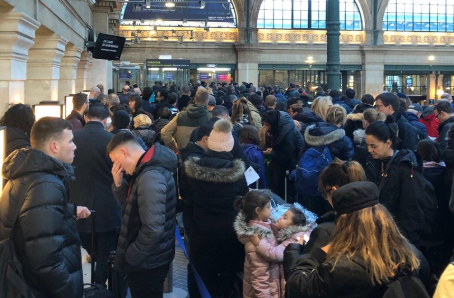 There were long queues at the capital's Eurostar hub again on Tuesday, even as the meeting with budget minister Gerald Darmanin got under way. Unions want additional staff and equipment, new infrastructure and better financial benefits. They intend to continue their protest indefinitely. They also say it demonstrates the chaos at customs checks that passengers will face after Brexit. Staff are following all safety and customs legislation to the letter - which involves additional checks for passengers, and has slowed down the flow of people and traffic through terminals at Eurostar, Eurotunnel and the ports in Calais and now at airports in the Alps. But the government has insisted 'everything will be ready' in time for the expected March 29 departure of Britain and Northern Ireland from the EU. "The French government has never believed in a Brexit, they are in total denial," Unsa secretary general Vincent Thomazo told Le Figaro. "Decisions should have been made a year ago, not three weeks before Brexit." On Monday, the manager of Eurostar at Gare du Nord tweeted that the service was experiencing delays of up to one hour - and the company later said that passengers should expect delays of up to three-and-a-half hours. We're very sorry for the ongoing delays on departure from Paris Nord today. Our trains are currently expected to depart up to 3.5 hours later than scheduled due to the Douanes' work to rule action. We appreciate your patience - we're doing all we can to ensure you're on your way. Passengers using the EuroTunnel have also been affected off and on over the past week, while lorry drivers travelling through Calais were among the first to be affected. Additional checks quickly caused a long tailback along the A16. The protests have already had an effect away from the transport hubs. The Harry Potter shop in Lille remained closed on Monday, because expected stock items that had been due to arrive over the weekend to restock shelves had been held up in transit due to additional checks in the work-to-rule.